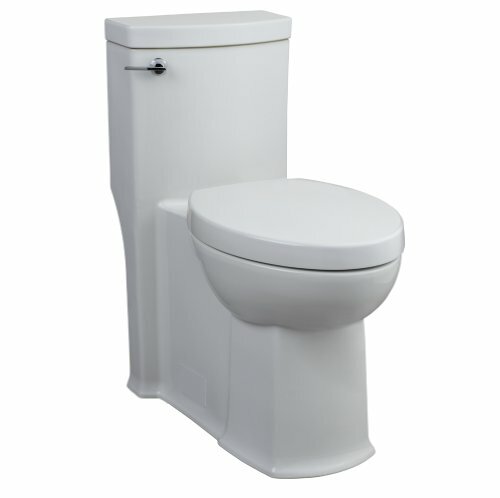 2891.016.020 Features: -Right height elongated one piece toilet.-Luxury Performance Toilet.-Low consumption (6.0 lpf/1.6 gpf).-Elongated siphon action bowl with smooth sided, concealed trapway.-PowerWash rim scrubs bowl with each flush.-Chrome trip lever.-Oversized 3'' flush valve with chemically resistant flapper.-Fully glazed 2'' trapway.-100pct Factory flush tested.-Design coordinates with Studio and Boulevard lavatories.-ADA compliant.-ASME A112.19.2-2008/CSA B45.1-08 Certified. Includes: -Includes color matched Duroplast Slow Close Toilet Seat and cover with easy lift off feature for simple removal and reattachment for cleaning. Color/Finish: -White finish.-Two color matched bolt hole covers. Dimensions: -Rim height: 16.5''.-Overall dimensions: 30.5'' H x 14.5'' W x 29.75'' D. Warranty: -Manufacture provides 10 years warranty.